Bennington Rep. Kiah Morris, left, and Hartford Rep. Kevin Christie, right, say the racial justice bill will lead to substantive criminal justice reforms. Lawmakers appear poised to pass legislation this year that would create a centralized board to oversee issues of racial justice in Vermont. Almost nowhere in the United States is the racial disparity in incarceration rates more pronounced than in Vermont, where a study by the Sentencing Project found that black people are jailed at a rate more than 10 times greater than those of whites. The legislation’s backers say the bill offers a mechanism to begin to identify the causes of that disparity. 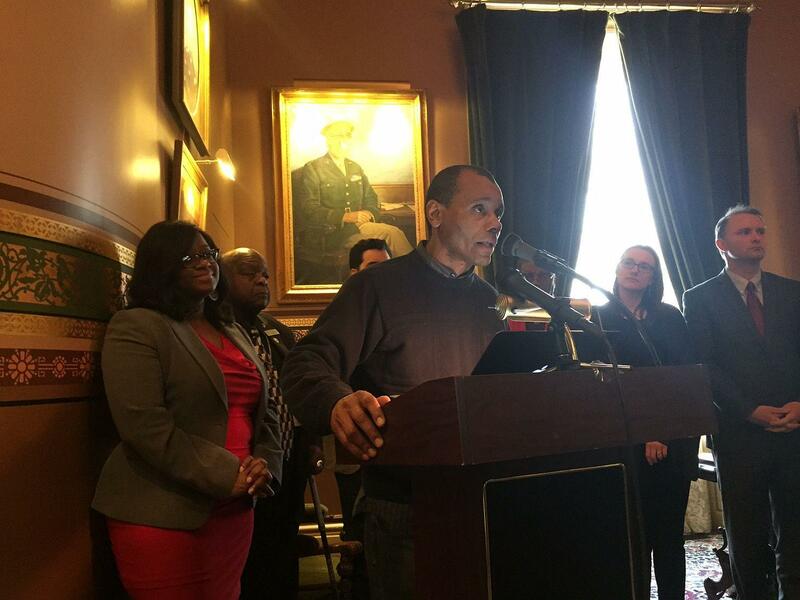 “Today is the time, now is the time, for us to establish a mechanism for ensuring that racial justice is happening in Vermont,” says Bennington Rep. Kiah Morris, one of the three lead sponsors of legislation introduced in the House of Representatives. Morris was among a coalition of advocates and elected officials who gathered in the Statehouse last week to introduce the “racial justice bill.” It calls for the creation of a 12-person Racial Justice Oversight Board; the panel would examine racial justice issues in the criminal justice system, and then report back to lawmakers with recommendations for reforms. Morris says the idea is to identify, and then root out, the underlying causes of racial disparities in policing and incarceration rates. She says Vermont already has a number of worthy racial justice initiatives afoot. “But we don’t have a way of coalescing that information and making sure the work is actually being done,” Morris says. The legislation is in many ways rooted in the advocacy work of Mark Hughes, the founder of Justice For All, an organization working on racial justice issues across the state. “We know more than ever that we have work to do in Vermont if we’re going to live up to being the progressive and the moral state that we say that we are,” Hughes says. Hughes has spent the first 10 weeks of the session building support for the legislation among advocates, lawmakers, statewide elected officials and criminal justice leaders. Hughes says the bill has won the support of 27 organizations. Attorney General TJ Donovan says it’s an appropriate place to focus the scrutiny. “The real work lies within the court system and judiciary, lies with the prosecutors, lies with the judges, lies with the defense attorneys,” Donovan says. Mark Hughes, founder of Justice For All, says policymakers need to focus on implicit racial bias in all aspects of the criminal justice system, not just with police. Mary Brown Guillory drove from Burlington to watch the press conference. Toward the end of it, she addressed elected officials from the audience. Guillory told them that her children have firsthand experience with the perils of driving while black in Vermont — she bought them dashboard cameras for their cars for Christmas. She said Vermonters of color need action, not more talk. As the mom of a black son herself, Morris told Guillory that she appreciates the urgency. “And I believe everyone here does understand clearly that we are not there,” Morris said. Morris says she believes the Racial Justice Oversight Board will lead to the substantive action Guillory is calling for. Lawmakers passed legislation in 2012, for instance, that requires every police agency in the state to collect roadside stop data, to allow for analyses of racial disparities in policing. But lawmakers have since learned that many departments were slow to comply. “We can place the laws here, but the work has to happen out there. And if there’s no one keeping an eye on that, then there’s no way we can ensure that that’s done,” Morris says. Morris says the Racial Justice Oversight Board will become the Legislature’s eyes on those kinds of problems. Curtiss Reed, Jr., the executive director of Vermont Partnership for Fairness and Diversity, has been working on racial justice issues for years. “In the historical context of racial justice in Vermont this [legislation] is a paradigm shift, a really positive paradigm shift,” Reed says. Reed says the Racial Justice Oversight Board will finally give the state an apparatus for determining whether individual state agencies are addressing racial injustice. Identical racial justice legislation has also been introduced in the Senate, and Morris says legislative leadership has indicated the bill will pass this year. Racial discrimination in Vermont can be an isolating experience — partly because the state has such a small percentage of people of color, and also because the problem often goes unnoticed by Vermont's overwhelmingly white majority. A new University of Vermont study shows disparities in how police officers around the state treat drivers of different races.